“Bucilla 11, modified, variation 1” shown here on the loom, front and back. Notice the extra long floats on the back of the square. My second attempt also leaves something to be desired since there are two plain weave rows at the top, making the pattern off-center. I’ve included written instructions both on and below the pattern chart. Hopefully they’ll help make the “slide” instruction more clear. When you slide the needle, you’re mimicking the path of L2, so it’s important to keep the rows in the right order when packing with your fork. You don’t want the rows to overlap each other. Sample squares were warped L1-3: color 1, L4: color 2. Yarn tails were worked in using the “as you go” technique. 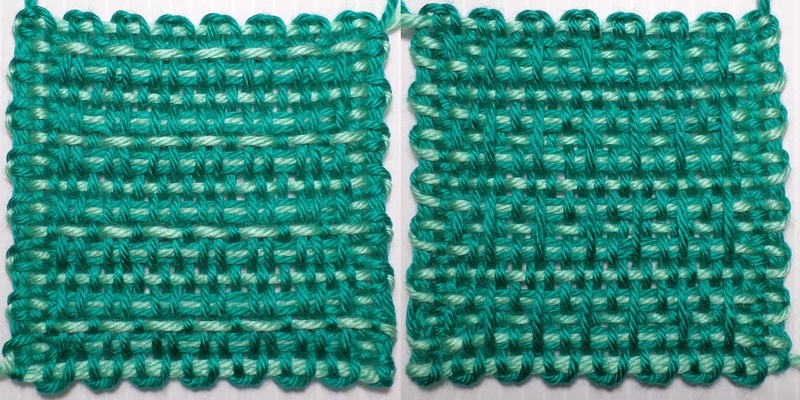 For a demonstration of that technique, see this post: Maple Leaf and this video: Two Color Squares and Weaving in Ends As You Go.